(Information Resource of the UGCC, January 24, 2015) The Father and Head of the Ukrainian Greek Catholic Church, His Beatitude Sviatoslav, expressed sympathy to the relatives and friends of the people who died on Saturday, January 24, at the hands of Russian fighters. He expressed solidarity with all the victims and their families. The leader of the UGCC assured them of his constant prayer for the deceased, the wounded, and all who have suffered at the hands of the aggressor. 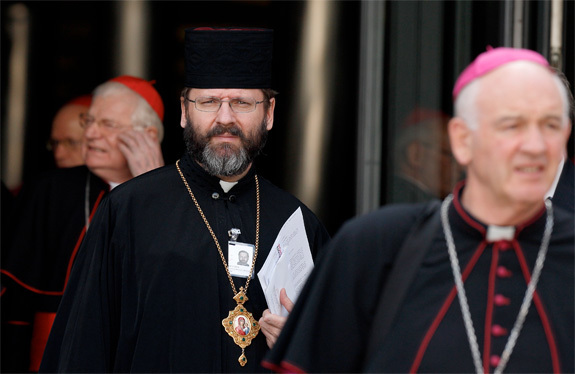 The Head of the UGCC called on the international community to help Ukraine establish peace on its territory, and on volunteers and international relief organizations to provide all necessary aid as quickly as possible to those who are suffering. The Ukrainian Greek Catholic priest who ministers in Mariupol, Father Rostyslav Spryniuk, reported by telephone that the entire UGCC parish, Transfiguration of Our Lord, and volunteers who permanently reside there are providing assistance to the victims, both in the hospitals and at the site of the tragedy. The priest asks all the faithful and people of good will to pray for peace in Ukrainian territory.